Sue Keable (pictured centre) cuts the ribbon to officially open the research centre alongside Dr Lachlan Henderson; Mr Scott Bulger; Professor Paul Fitzgerald; Sue's son Murray and Carolyn Bell. The ECIMH is part of Epworth Clinic’s mental health service offering in Camberwell, conducting research to better understand mental health, develop new treatments and improve existing treatments for people experiencing mental health concerns. Professor Fitzgerald leads a multidisciplinary team of psychiatrists, psychologists, mental health nurses, researchers and engineers who are all dedicated to enhancing mental health outcomes. Professor Paul Fitzgerald and the Epworth Centre for Innovation in Mental Health research team. Together, they will focus on improving transcranial magnetic stimulation (TMS) treatment for depression, investigating TMS as a new treatment for OCD, PTSD, chronic pain, Alzheimer’s disease, Parkinson’s disease and addiction, and developing and evaluating other innovative treatments such as transcranial Alternating Current Stimulation (tACS) for OCD and depression in young people. 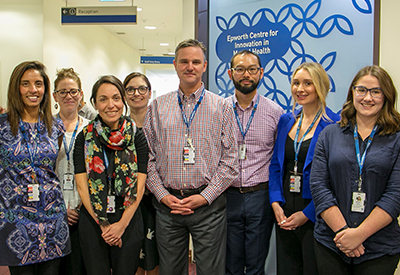 The ECIMH has a newly-built space at Epworth Camberwell, comprising clinical labs and research offices and a growing suite of sophisticated neurostimulation and monitoring equipment. "Across Epworth, we work in an organisational environment that supports its staff to innovate and strongly encourages the translation of evidence-based ideas into clinical practice. This has shaped the formation of ECIMH. Learn more about the Epworth Centre for Innovation in Mental Health here.